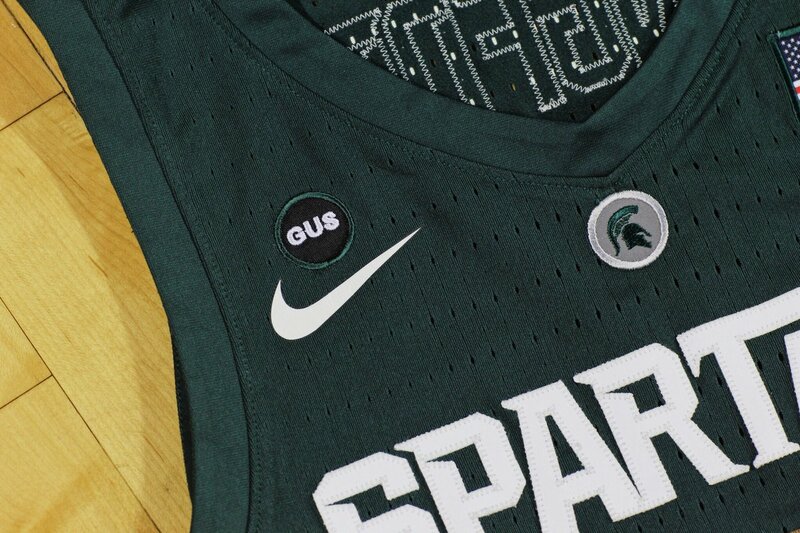 The “Gus” patch adorning Michigan State’s basketball jerseys have represented the indomitable character of Gus Ganakas. The team has stitched the spirit of the late Spartans coach to their Final Four run. The patch’s story is one that the CBS TV crews have failed to properly tell the nation during the march, especially during opportunities with a close-up camera shot of a player at the free-throw line or on the athletes on the bench in a timeout. Not that the oversight diminishes the pride the family feels watching the Spartans’ march to college basketball’s penultimate weekend in Minneapolis. Michigan State coach Tom Izzo ordered up the patches following Ganakas’ death on January 11 at age 92. Spartan Nation knows the story, although younger fans may not appreciate the context spanning four decades. “Tom said at the funeral what he was going to do with the patches,” said Gary Ganakas, who played for his father’s teams in the early 1970s, although Gus wanted him to go to Miami of Ohio to avoid fan criticism. “Tom said dad was one of those people everyone knew by his first name. It’s been quite and honor for our family. Izzo was inducted into the Naismith Memorial Basketball Hall of Fame three years ago, but his credentials haven’t prevented him from crediting the vital role Ganakas played to reassure Earvin "Magic" Johnson of nearby Lansing Everett to stay home. Two years later he led Spartans to the 1979 national title. With that Magical building block, Izzo stood on the program foundation he inherited and raised it to what the Spartans are today–chasing the school’s third national title in its 10th Final Four trip. This is Izzo’s eighth Final Four, including the 2000 the NCAA title. In short, Ganakas was fired on March 16, 1976, a year before Magic graduated from high school. Ganakas was let go despite a strong bond with Johnson dating to youth summer basketball camps on the East Lansing campus. Ganakas knew at the time Johnson’s commitment to him and Michigan State was fait accompli. Otherwise there never would have been a prolonged national recruiting battle, which opened the door to Johnson nearly committing down the road to rival Michigan. The thought of Johnson leading the Wolverines remains apocalyptic to this day to Michigan State fans. But Ganakas never turned bitter over his fate then or until his final days. The magnanimous Ganakas told Johnson he could trust playing for Jud Heathcote, his successor. Heathcote, coach of Magic’s 1979 national title team, and Izzo, Heathcote’s long-time assistant, both welcomed Ganakas around the program as a radio analyst and confidante. “You'll learn all you need to about Gus when you look at the way he handled being replaced as head coach. Most of us would have wanted our replacement to fail, hoping it would make us look good. But that wasn't who Gus was. Gary Ganakas said his father’s “love of Michigan State” as an institution and the “East Lansing” community superseded his fate at the hands of administrators that chose to dismiss him. The subject wasn’t rehashed around the dinner table or at family gatherings and holidays. A month after Ganakas passed away, Johnson discussed Ganakas' influence on him when he returned to campus for the 40th anniversary of the 1979 NCAA title and met with the media. Ganakas first arrived on campus in 1946 after serving in the Marines during World War II, including the brutal fighting in Okinawa. He returned home to Mt. Morris, N.Y., married his wife Ruth, brought her with him back to East Lansing and they never left (Ruth died in 2014). They raised six children -- Gail, Gary, Greg, Anne, Amy and Marcy. After graduating, Ganakas took a teaching and coaching job at East Lansing High. He led his unbeaten 1958 basketball team to the Michigan High School Athletic Association Class B state title. 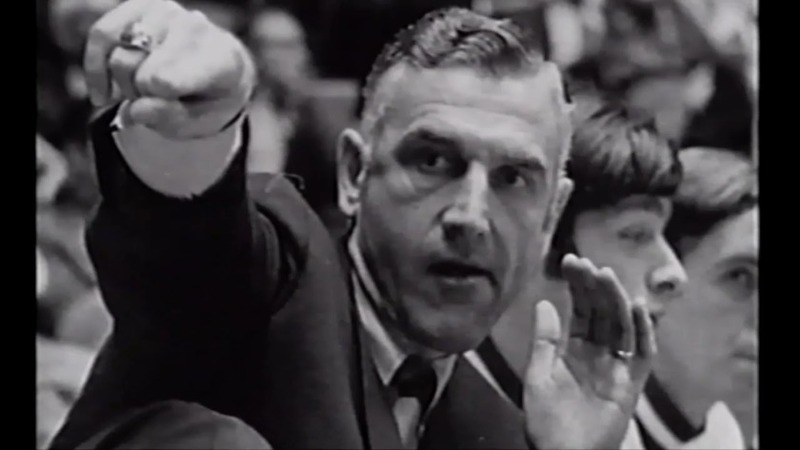 While at East Lansing, Ganakas learned basketball from Pete Newell, a basketball guru whose time at Michigan State (1950-54) was sandwiched around the 1949 NIT title at the University of San Francisco when the NIT still meant something and an NCAA title at Cal in 1959 with repeat trip to the finals and runner-up finish to Ohio State in 1960. John Bennington took over the program in 1965-66 and a year later hired Ganakas as an assistant. Three seasons later Bennington died from a heart attack just a a month before practice was to begin. Ganakas was named head coach. Bennington’s death was a tragedy, but Ganakas soon faced a Shakespearean basketball tragedy, although neither the first or second acts broke his spirit. The first act was Ganakas as the victim of the second one-and-done in college basketball history. In the 1969-70 season, sophomore Ralph Simpson (freshmen were ineligible in those days) earned All-American honors averaging 29.0 points and 10.4 rebounds a game. The Spartans finished only 9-15, but Simpson was a cornerstone for a brighter future – until signed a pro contract with Denver in the upstart American Basketball Association under its hardship rule. The first one-and-done was Spencer Haywood, a year earlier out of the University of Detroit. Haywood and Simpson had been teammates on a state championship team at Detroit Pershing. The second act played out in the middle of 17-9 season, 1974-75. On January 4, 1975, Michigan State’s 10 African-American players on a 12-man roster walked out on their coach prior to a home game against No. 2-ranked Indiana. They wanted Thomas McGill, a 6-foot-4 senior black player, to start and defend Indiana’s 6-7 Steve Green, a third-team All-American that season, over Jeff Tropf, a 6-7 white freshman. The sad irony of the black players walking out was Ganakas had been ahead of his time recruiting black athletes, similar to Michigan State’s pioneering Underground Railroad football teams coached by Duffy Daugherty. If you doubt that, consider the 1974-75 Indiana team numbered only five black players. That team was the nucleus that returned a year later as Indiana claimed the last unbeaten NCAA title in college basketball. The walk-out lasted only one game, but the damage was done. The administration couldn’t let a player revolt determine a coach’s future. It waited one more season to do that. Adding to Ganakas’ fate, in the same time frame the NCAA investigated Michigan State’s football program for recruiting violations under Denny Stoz. The Spartans were slapped with a three-year probation. Stolz and Ganakas were fired as new athletic director Joe Kearney took over the program with a fresh start. There would be no NCAA trips for a Ganakas in an era when the now 68-team tournament invited only 25 teams in 1970 and expanded to 32 by 1976. His career record was 89-84, with All-Americans Ralph Simpson, Mike Robinson and Terry Furlow. But not even the timing of the walkout that cost Ganakas a chance to coach Magic Johnson embittered Ganakas. “My dad would never say it, but I’ve had coaches tell me he would have won two national titles with Magic,” Gary said. Heathcote understood Ganakas’ role in Johnson ultimately committing to the Spartans. He welcomed having Ganakas around the program and working as a radio analyst. Izzo had been around as a Michigan State assistant Heathcote hired in 1983. He didn’t need to have the importance of Ganakas explained to him when Heathcote retired and he was promoted for the 1995-96 season. Heathcote retired to Spokane in his home state of Washington to allow Izzo space to establish his own mark on the program. With Heathcote, Ganakas was a selfless man that allowed Heathcote to lay the Magic foundation. But with Izzo, Ganakas was more to him. On the return from road trips, the two of them would huddle in the back of the plane on the flight and review the video. “I was lucky enough to go on enough road trips with my dad,” said Gary, who is retired from his own business career. “Tom liked to have somebody he could talk to about the game or what was going on with team. Dad would listen and make a comment or two. Two years ago Izzo began the Gus Ganakas Award, the team’s most valuable player as voted by the players. But even after Heathcote and Izzo welcomed Ganakas, Michigan State wasn’t through testing Ganakas’ unconditional love for the school. As Gus aged toward his 70s, Gary said the administration told him he had to give up his tenure if he wanted to keep working on the radio. That says more about Ganakas’ love of Michigan State than his resolve. Remember, this is a man that fought on Okinawa when the Japanese literally lived up to their banzai code to fight to the death. Eventually, Father Time began to slow down Gus as he blew through his octogenarian decade to nonagenarian. In the 2016-17 season, he limited his radio work to home games; he gave it up completely in 2017-18. Gary said the family thought the proper thing to do was to write a resignation letter. The radio connection also kept Ganakas involved with the players. Although he last called games when junior Cassius Winston was a freshman, the players knew him. Gary helped his father attend a practice for one of the last times in the 2017-18 year, slowly walking him onto the practice court in the Breslin Center. Gary mentioned Winston, Matt McQuaid, Kyle Ahrens and Connor George attended his father’s funeral, although he feared he left out mentioning a player that also might have attended. Gary credits the players attending to Izzo’s insistence his players understand and appreciate the program’s history. He routinely has his players interact with any former players, coaches or distinguished alumni that stop by practice. Players from Pete Newell's 1950s teams have said when they gathered at a practice as part of a reunion with their old coach, Izzo's players shook their hands, introducing themselves, even though it was the old-timers that needed introduced. But that didn’t make that last moment with his father any less moving to Gary and the family. “That’s the kind of person Tom Izzo is,” he said. “Dad died about 12:30 (in the afternoon), Tom heard about it and was at the house by 1. Tom and his wife Lupe and their two kids (Raquel and Steven) visited the house twice near the end. Lupe held his hand and talked to dad. Dad's memory wasn't good and he'd ask Lupe about her parents. Lupe's parents are gone, but she'd tell hem they were fine. Tom had all this going on with his team – the injuries – and he still was taking time to visit." At the 40th anniversary of the 1979 national title in February, Johnson and an All-American Greg Kelser were among the players that returned to campus and spoke about how much Ganakas meant to them. Johnson called Gus his “coach,” even though he never played for him. Kelser actually played for Ganakas in the coach’s final season, 1975-76; he said Ganakas was the reason he picked the Spartans. How Gus Ganakas managed to shut the door to bitterness over losing his job and jealously as the Spartans and Johnson won without him, no longer hovered over him later in life, Gary says. They saw how much Gus enjoyed his connection to the Michigan State program throughout Tom Izzo’s 24 seasons.